This company is convinced we need food delivery robots. Our lives are filled with other humans. We interact with them constantly — at work, at home, at stores where we buy what we need to sustain ourselves, even the delivery people we have digitally summoned to bring us goods when we don’t want to face the world. Sure, we need community to survive or whatever, but sometimes you just want to take a break from other humans. San Francisco-based Starship Technologies wants to remove any human interaction, at least from the process of buying lunch. 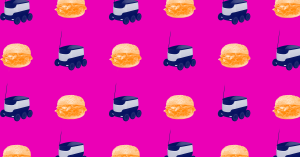 The company is expanding its fleet of autonomous robots to include tiny robots that deliver your lunch for you, Wired reports. The company is ready to start offering the service to other companies as well after testing it at a California-based company campus. The little Starship troopers are about the size of a middle-aged Saint Bernard, have six little wheels, and move at a maximum speed of 4 miles per hour (6.4 km/h). To use the bots, users enter their order into an app. The restaurant making the food puts it inside the little robot, which makes its way across campus. The bots only stay outside, so users have to come to the entrance of a building, where they unlock the robot’s container by entering a unique code. Delivery usually takes between 15 and 30 minutes. 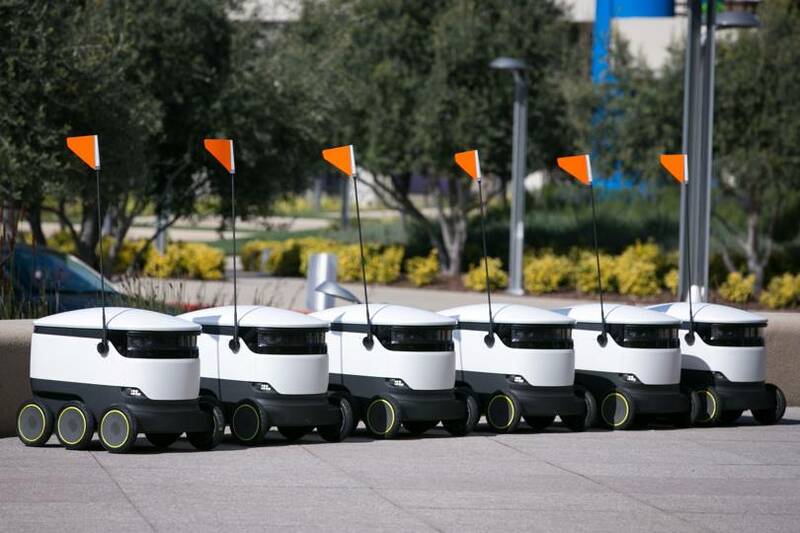 Since January, the little robots have been serving a whole campus of hungry workers at the Silicon Valley-based software company Intuit, and the company is planning to deploy more than 1,000 robots to colleges and workplaces by the end of the year. Starship calls this the first “major commercial rollout” of its kind. It’s easy to see why this may be popular with users — no human interaction at all, even if they still have to get up and go to the door to retrieve their sustenance. On-demand delivery startups such as Seamless and Uber Eats have turned the food delivery industry into a booming market. Anyone with a bike or a Honda Civic can make a few bucks on the side by delivering food. And for people with mobility issues, services like these could be a godsend. “It didn’t take long after injuring my foot to fully appreciate the capabilities of Starship’s campus delivery,” says Srivathsan Canchi, a Product Lead at Intuit, in the press release. “I love that I was able to get my coffee delivered to my doorstep! But not everyone has been so enthusiastic about the bots’ predecessors. Sidewalk-based delivery robots have been a controversial topic for cities like San Francisco in the past. They are often unwieldy, take up a large portion of a busy sidewalk, or simply get stuck. Late last year, the San Francisco Board of Supervisors ruled that robots weren’t allowed to make actual deliveries, after complaints filed by pedestrian safety advocacy groups. In other places, such as Washington D.C., Virginia, and Idaho, sidewalk robots are being legalized. Human couriers, whether they’re on a bike or in a car, are already being replaced by robots, and if Starship’s efforts are any indication, in-person deliveries are about to become a lot more rare, though they could arguably better serve people with mobility issues because the human could bring the goods right to them. And those users will almost certainly be in the minority. Our sidewalks are already crowded. Fitting in a few more six-wheeled friends is pretty much guaranteed to become a sore point for many city-dwellers. For the average person looking for a break from human interaction, maybe you’d be better off just renting a cabin in the woods for a little while.